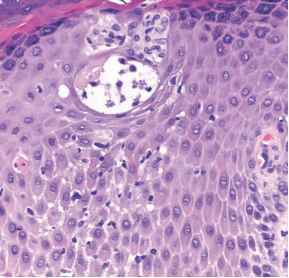 There are nodular or diffuse monomorphous infiltrates of lymphoblasts which may be separated by the epidermis by a Grenz zone (Figs. 1 and 2) (6). The infil trates display a ''cobble stone'' or "starry sky'' pattern and consist of blasts of various size with condensed or finely dispersed chromatin and blue-gray cytoplasm (Fig. 3). 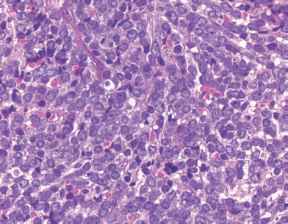 Figure 2 Precursor B-cell lymphoblastic leukemia/lymphoma: Infiltrate of medium-sized pleomorphic cells. 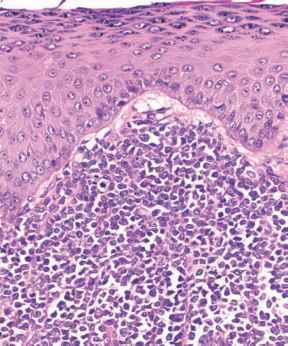 Figure 3 Precursor B-cell lymphoblastic leukemia/lymphoma: Infiltrate of tumor cells in the bone marrow demonstrating nuclei sparse chromatin.